I'm certain that I have mentioned in previous September posts that the summer to autumn turn of the year is the one time I find myself wanting to put on the brakes and hang on to the previous season with all my might. I actually prefer the cooler temperatures of autumn...but I dread the loss of the light. This year feels different though. We had an extremely cool and temperate August (I'm not sure the temperature went over 90° even once...which is sort of unprecedented in the Midwest)...so I've kind of begun to get used to the idea of autumn a bit earlier than usual. Moreover, I began eating pears early this year. 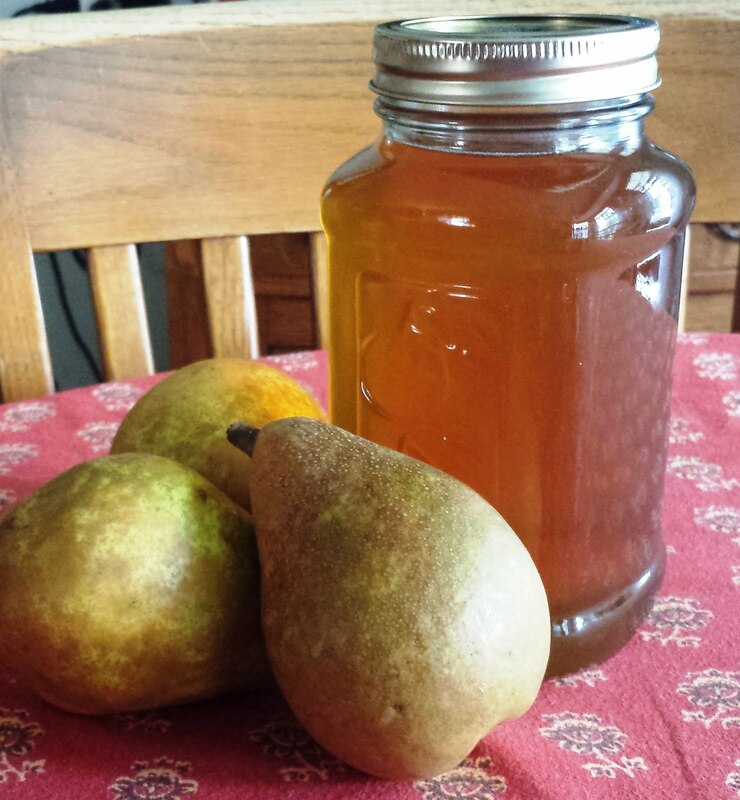 Pears always begin showing up at the farmers' market in August. And I resolutely resist them until mid September...or even later. But not this year. 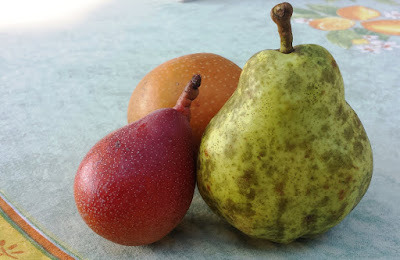 One of the growers at my new farmers' market grows a huge variety of pears and has kindly offered me samples of several. They have been spectacular. I have especially enjoyed them since the local peach harvest came to a much earlier end than usual (or so it seemed to me). 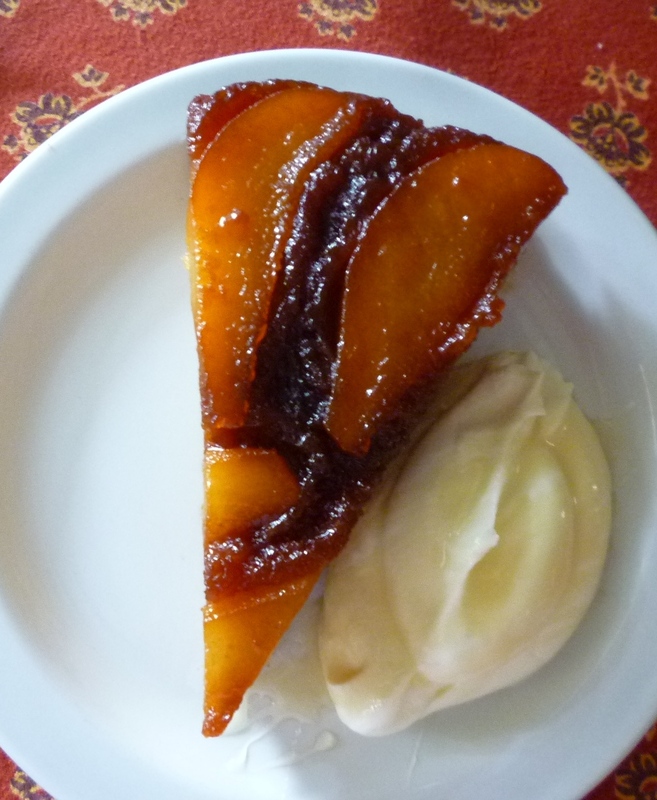 As I have been considering what to do with these beautiful pears (other than simply eating them raw as a snack or in a salad) I remembered a dessert that I haven't thought about in years: a Pear Upside-down Honey-Spice Cake that I developed for the National Honey Board. I'm not sure why I ever stopped making this cake. It is just the kind of simple, elegant-but-with-no-frills kind of cake that I like. If you like gingerbread, you will love this cake. 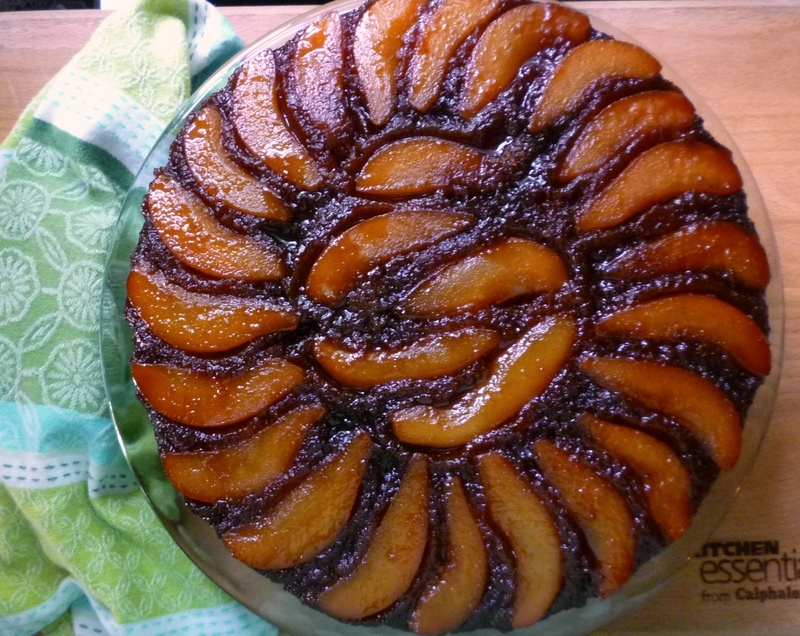 I developed it using a favorite gingerbread cake as a starting point (albeit with a greatly reduced level of spice—the original amount would have overwhelmed the delicate perfume of the honey and the pears). 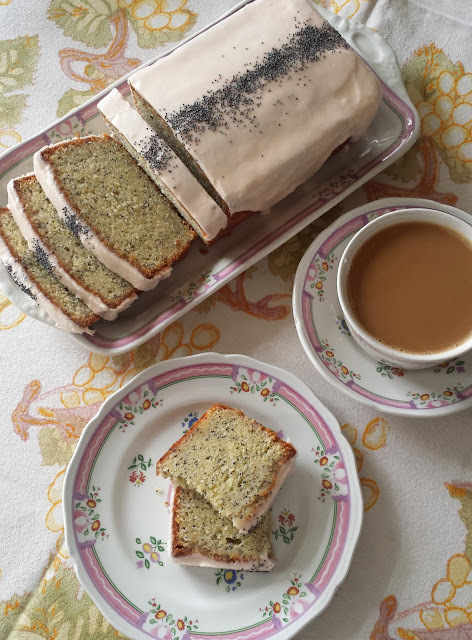 Since I have altered that favorite gingerbread cake in the intervening years since I developed the honey cake, I decided to change the honey cake when I made it this time, too. I like the new version even better than my original. 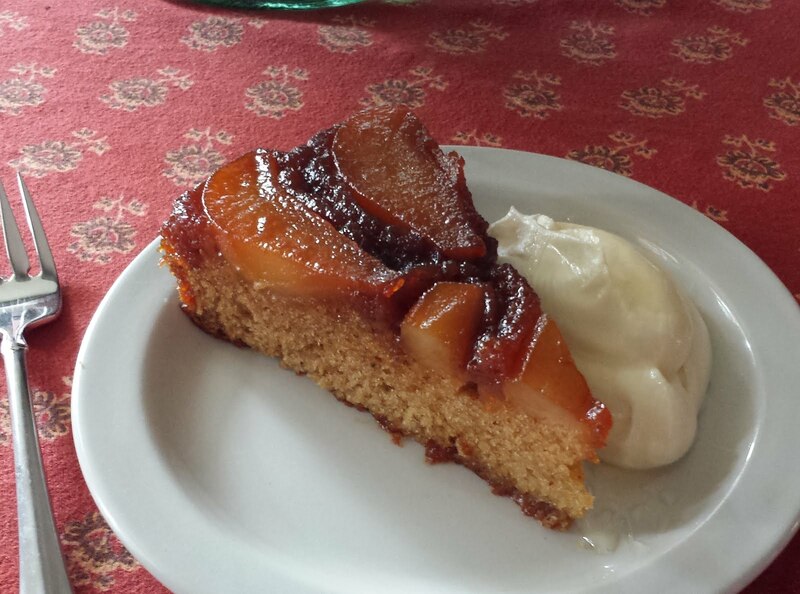 I made my cake with local Warren pears and local honey from my farmers' market. And I encourage you to seek out local ingredients for your cake too. 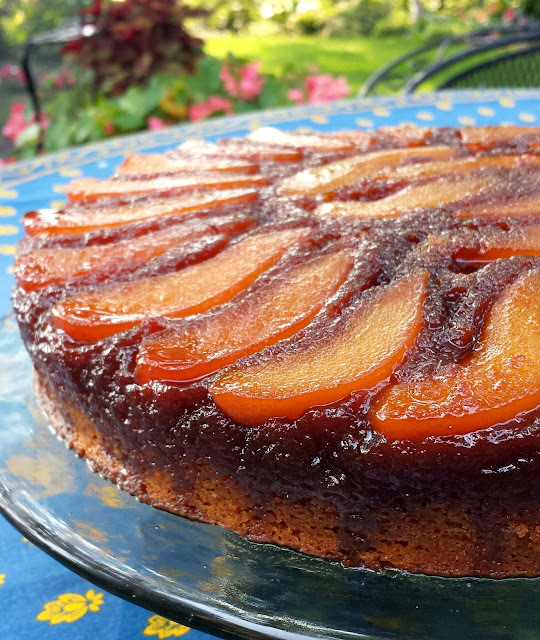 Any flavorful and fragrant honey that tastes good with the pears will be good in this cake. And any pear that is similar to the Bartletts, Boscs, and Anjous that typically populate the produce aisles of your local grocery store will be fine. Look for medium-sized (6 to 7 oz. each) pears that are just beginning to be ripe. They should still be slightly firm for this cake. Typically at the end of August and during the early days of September I am scrambling to make as much of the end of the peach season as possible—peach coffee cake, peach shortcake, peach galettes.... Pears don’t begin to make their way into my baking until late September (actual autumn). 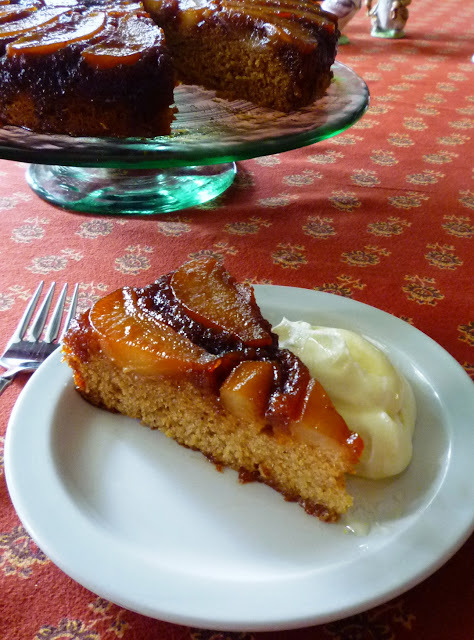 But this year, making this very autumnal pear & spice cake over the Labor Day weekend was truly a pleasure. Having it on hand to enjoy helps me to remember that there are delights associated with every season. So here's to autumn....and to the bounty of pleasures to be found in the season to come. Preheat the oven to 350°. 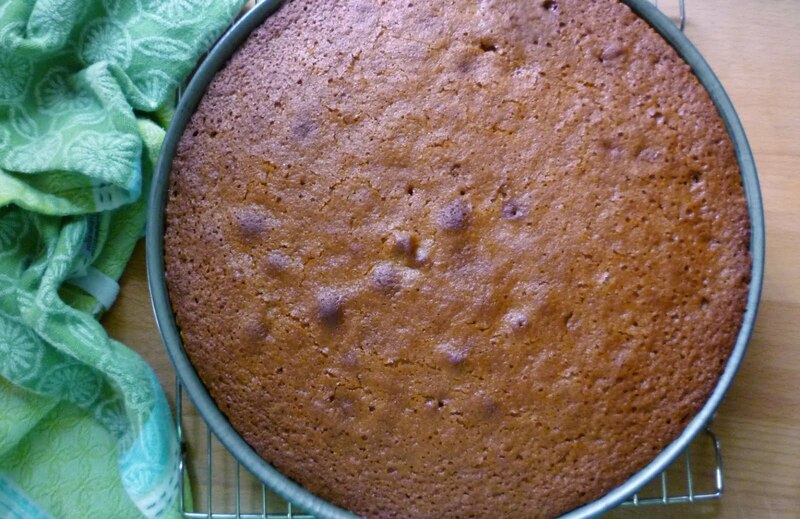 Butter a 10x2 –inch round cake pan (do not use a shallower pan—the cake will over-flow). Put the stick of butter and the honey in a saucepan and place over medium heat. Gently warm until the butter is melted—do not let the honey boil. Whisk to combine; set aside and keep warm. In a small bowl, combine the egg, buttermilk and vanilla; set aside. Place the dry ingredients in a large bowl and whisk to blend; set aside. Peel the pears. Cut into quarters lengthwise and remove the cores. Cut each quarter in half lengthwise. Place the sugar in a nonstick (cast iron is perfect) sauté pan and place over medium high to high heat. Watch carefully—the sugar will begin to melt almost immediately and will turn to caramel as it melts. Shake the pan back and forth occasionally to prevent the melted sugar from burning and to expose more dry sugar to the heat. If the sugar begins to smoke, lower the heat a bit. Eventually there will be a few hard lumps of sugar floating in liquid caramel. Remove from the heat and stir with a wooden spoon until all the remaining lumps and all the sugar granules are dissolved and the caramel is a clear golden amber. Briefly return the pan to the heat to dissolve any stubborn lumps and, if necessary to deepen the color a bit. This whole process will only take a minute or two. Remove the pan from the heat and add the 3 T. of butter—be careful, the hot caramel will sputter when the butter is added. Stir until the butter is incorporated and the caramel is smooth. 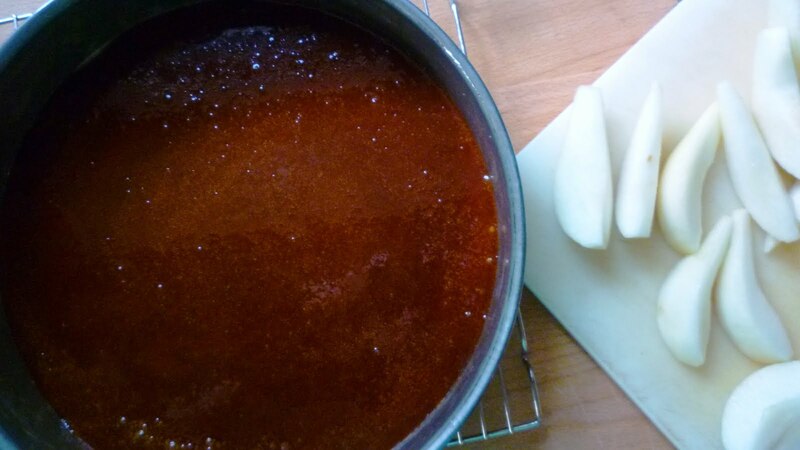 Working quickly, pour the hot caramel into the prepared cake pan—tilting the pan to completely cover the bottom. Being careful not to burn your fingers on the hot caramel, fan the pears in a circle around the edge of the cake pan; fill in the center with the remaining 6 or 7 pear slices. 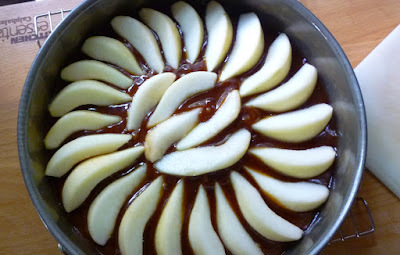 If the caramel hardens before the pears are in place, set the pan over low heat (or in the oven) to soften the caramel. It is important that the pears are “stuck” in the caramel as it sets up as the batter is quite thin, and the pears will float if they are not “attached” to the caramel. Set the pan aside. Pour the honey/butter mixture over the dry ingredients and whisk until smooth. Add the egg mixture and mix with a rubber spatula until well combined. Pour the batter over the pears. Bake the cake until the cake springs back when pressed very lightly and a toothpick inserted in the center comes out clean—about 40 minutes. Cool the cake for 10 minutes in the pan. Invert the cake onto a serving platter. Serve slices of cake with a dollop of lightly sweetened whipped cream drizzled with a little honey. Also, if you used unsalted butter in the pear topping, a few flakes of sea salt sprinkled over each slice really lifts the flavors. Cake serves 12. If you don't have a 10- by 2-inch round cake pan, a 10-inch cast iron skillet is perfect. It is very important to prepare the recipe in the order written—i.e. 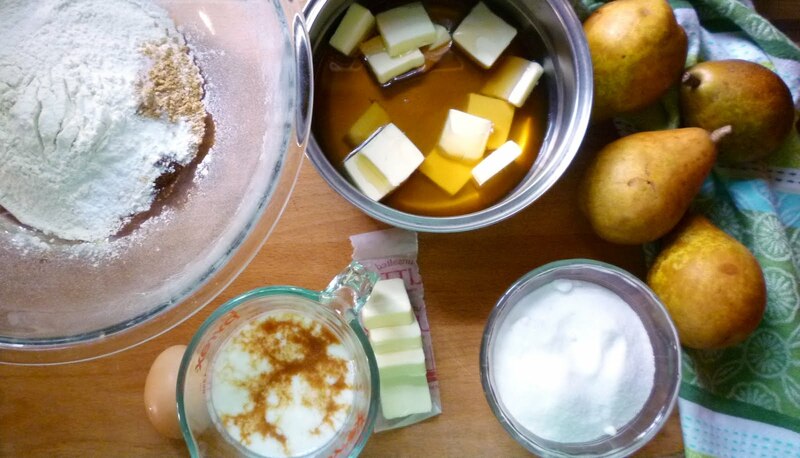 to mix the dry ingredients, honey-butter syrup, and the egg-buttermilk-vanilla mixture first before peeling and slicing the pears and making the caramel. Not only do you have to work quickly to embed the pears into the caramel before it hardens, you must finish mixing the batter and then put it in the pan immediately after combining the pears and caramel. The reason for this is that the pears begin to cook and release their juices almost immediately upon contact with the hot caramel. When they release enough liquid, they will begin to detach from the hard caramel...and will float in the batter rather than staying stuck to the bottom of the pan. If your pears are larger than about 6 or 7 oz. each you will probably only need 3 pears. If his is the case, cut them into 10 or 12 slices each instead of 8. Hi Theresa, I hope you were able to get to the market and find what you were looking for. Several of the growers at the Brookside market have fantastic eggs.